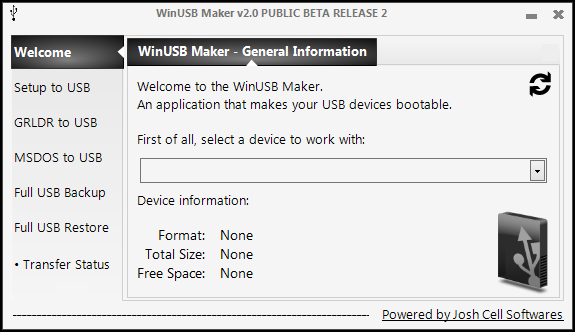 WinUSB Maker, is a tool to make dynamically any Removable Device / External HDD as bootable with Windows Setup. Watch the video to know how make usb bootable windows OS. Without any OS File-Mod – Your OS is clean transloaded to USB device. USB OS Transload compatible with Windows XP / Vista / Server / 7 / 8. Low memory and CPU usage for an fast OS Transload. Metro-UI Based compatible with Windows XP. Compatile with all Microsoft OS with .NET Framework v4.0. Backup and Restore is compatible only with the same device. MSDOS and GRLDR (Grub4DOS) compatible transload. Memory protections and code defuse improved. OS based with the Windows boot kernel is also compatible. (As Norton Ghost and Recovery Systems).